Recipe adapted from Southern Living Cookbook. Combine flour and salt; cut in shortening with a pastry blender until mixture is crumbly. Sprinkle ice water, 1 T at a time, evenly over surface; stir with a fork until dry ingredients are moistened. Shape into a ball; cover and chill until ready to use (at least 30 minutes). Roll pastry to 1/8-inch thickness on a lightly floured surface. (I find that I have to have my surface more than "lightly floured" or else the dough sticks to the table and breaks when I try to remove it. If the dough is sticking to the table despite the flour, use a flat spatula to gently scrape it off the table. Usually this works just fine.) Fold in quarters, place in pie plate, and unfold. Trim excess pastry along edges. For lattice top: roll out second ball of pastry as directed; cut into one-inch strips. 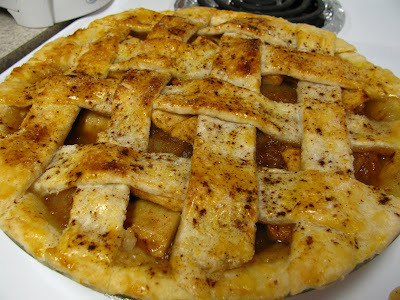 Weave in lattice over filled pie. Separate 1 egg yolk and beat slightly; brush over lattice with pastry brush. Sprinkle with cinnamon and sugar. Combine apple and lemon juice in large bowl. Combine next 4 ingredients. Spoon over apple mixture, tossing gently. Spoon filling evenly into pastry shell, and dot with butter. (Alternatively - if you are making the pie in stages, you can mix up the crust and the filling and put each of them in the fridge for a few hours. This marinates the apples and makes a nice sugary sauce... if you do that, leave out the butter.) Cover pie with lattice top. Cover edges of pastry with aluminum foil. Bake at 450 for 15 minutes; reduce heat to 350 and bake 50 more minutes. Dish up and enjoy!